After a trip to IKEA at Lakeside, Sue and I dropped into the RSPB reserve at Rainham Marshes for a coffee and a quick walk around the woodland area of this large marshland reserve. The woods were full of song, much of it from newly arrived migrants and Common Whitethroat, Chiffchaff and Blackcap were seen. 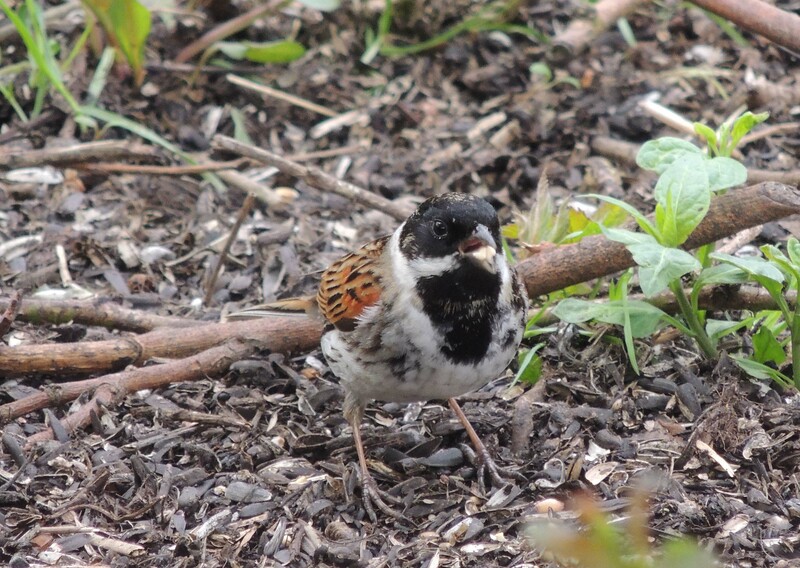 Sedge and Reed warblers were calling from the nearby reed beds and we came across one very tolerant Reed Bunting which happily posed for pictures. 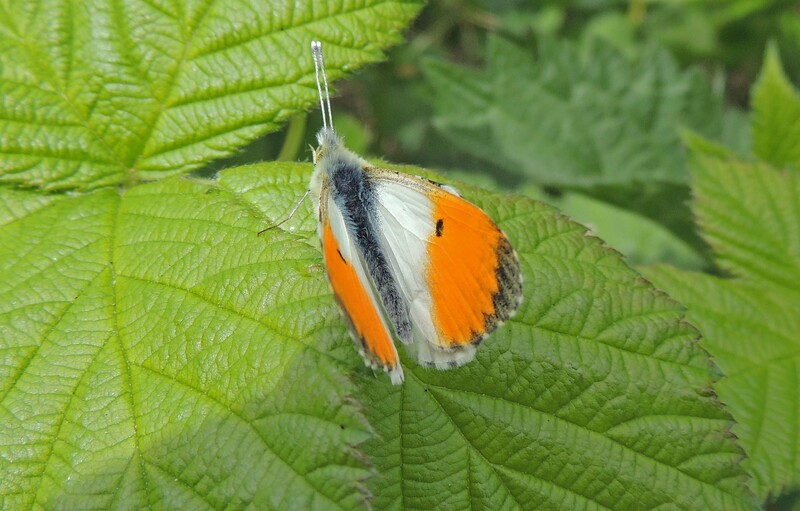 There were also good numbers of butterflies with Orange Tip particularly numerous. A single Swallow was the first sighting of this summer migrant for me this year. 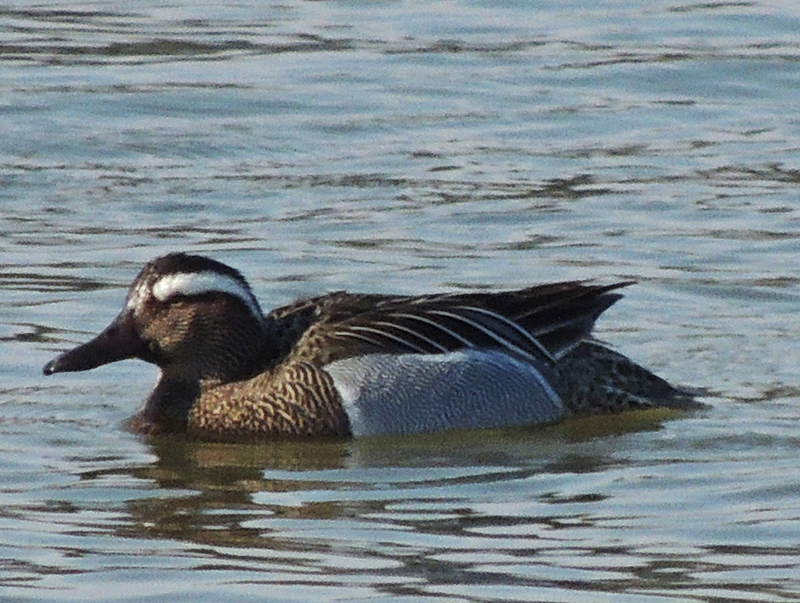 Later we stopped for lunch at Bough Beech and were rewarded with sightings of Garganey and Little Ringed Plover both recently arrived from their Winter homes, together with my first House Martin of the year. 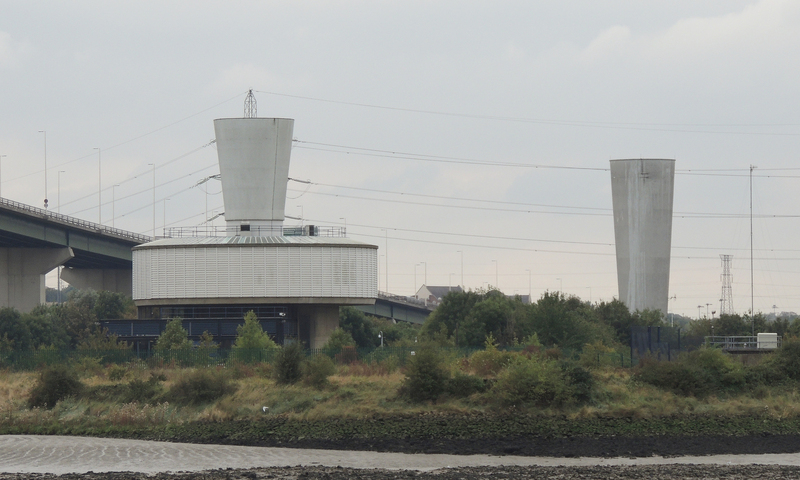 As we proceed under Queen Elizabeth II Bridge at Dartford, two strange chimney-like structures are visible on each bank. These are the vents from the Dartford Tunnel. In fact there are 2 tunnels. The first was built in 1963 and carried two-way traffic. A second was added in 1980 with each tunnel now carrying one direction flow. 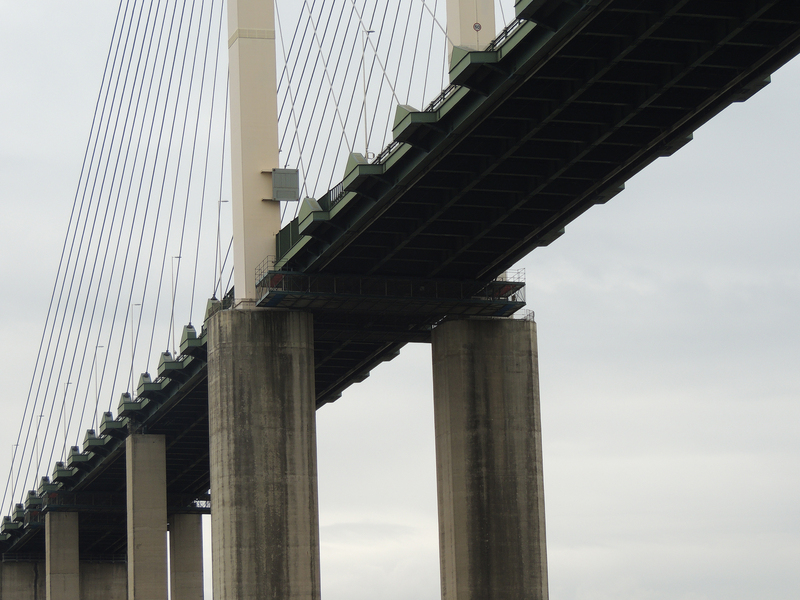 With the addition of the Bridge in 1991, both tunnels now carry northbound traffic with the south-bound using the bridge. 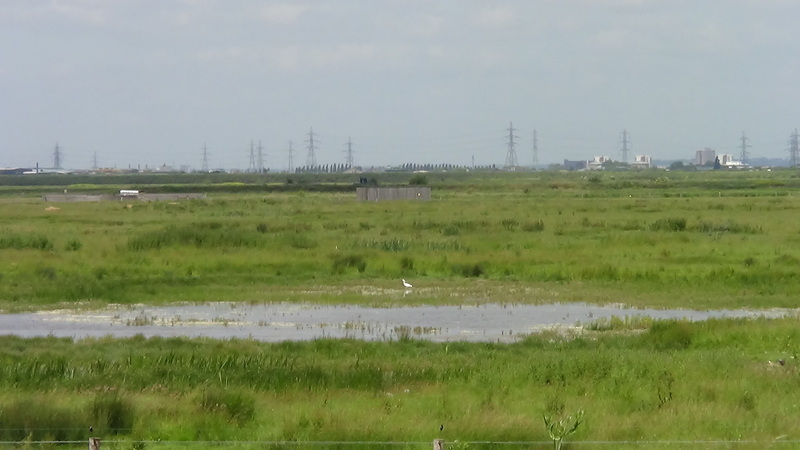 On the north bank we pass the RSPB nature reserve at Rainham Marshes, one of the few protected stretches of estuarine marsh left. We pass the dock of the two boats, Thames Clearwater I and II . These are used to aerate the river if oxygen levels fall below a set level in order to try to prevent any loss of marine wildlife. 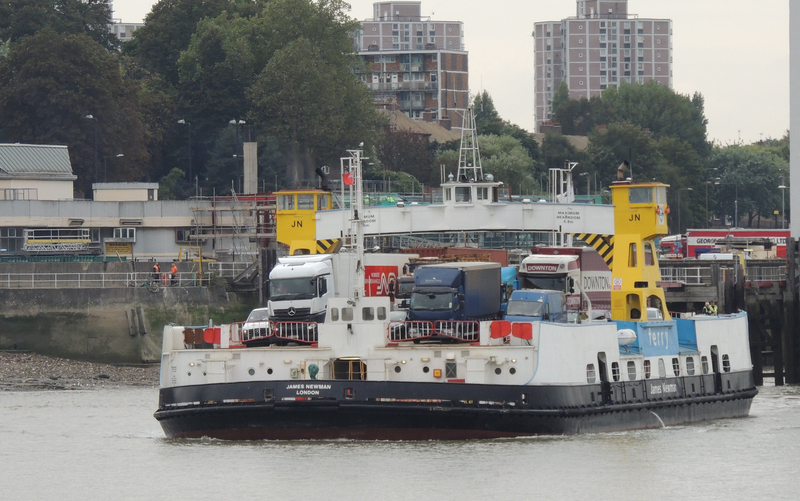 Another long-standing feature of the river is the Woolwich Free Ferry. This carries vehicles and foot passengers from Woolwich town centre on the south bank to North Woolwich across the river. This has been the site of a passenger ferry since the 15th century, although the vehicle ferry dates from 1889. The current boats are now over 50 years old and there has been an on-going discussion in London about what will be done to replace them. The current schemes seem to be a bridge downstream and another tunnel upstream as these are seen as more efficient ways of moving traffic than ferries. There are often long queues of traffic waiting to board the ferry and particularly on the southern side this can back -up onto nearby main roads. Berthed near here is a boat far from home, the Royal Iris. Built in 1951 for the Mersey Ferry, she became famous for the parties held on her in the 1960s with bands such as the Beatles, Gerry and the Pacemakers, the Searchers and Elvis Costello performing onboard. 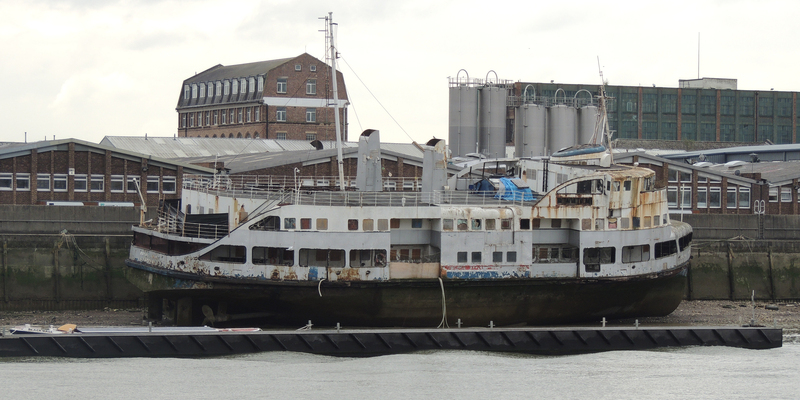 Withdrawn from service in 1991 she was used as a floating nightclub but has now been berthed on the River Thames. Efforts to return this iconic Liverpool boat to it’s hometown have foundered on the cost of making her seaworthy for the voyage. 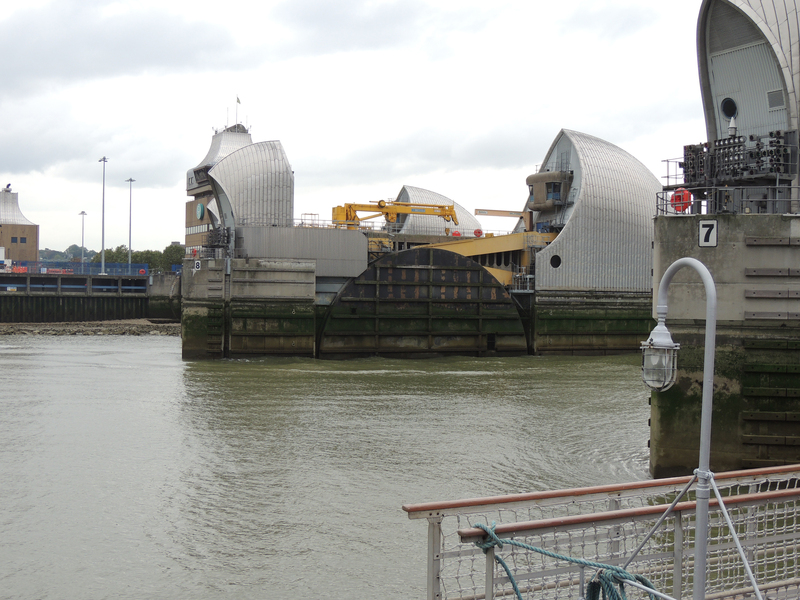 Beyond Woolwich, we approach the Thames Barrier. Built in 1984 to prevent the flooding of London on high tides. 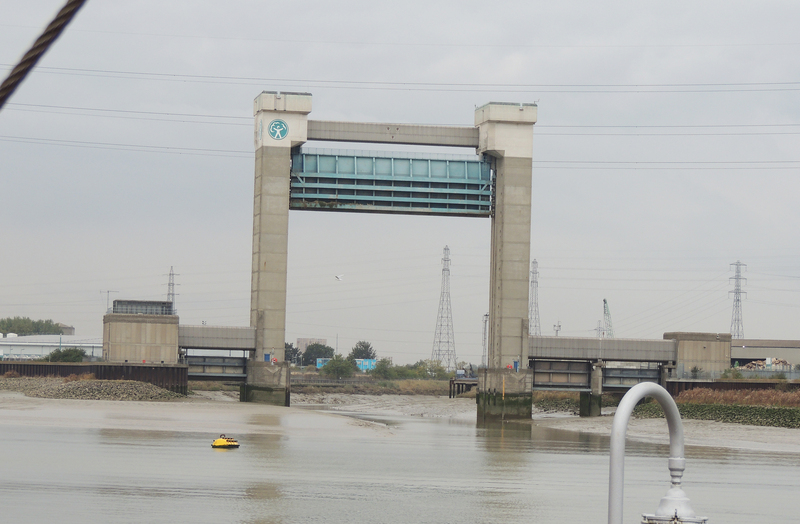 The gates in normal use lie along the riverbed, enabling unhindered passage to shipping but when required they can be raised into place to prevent surge tides reaching the capital. 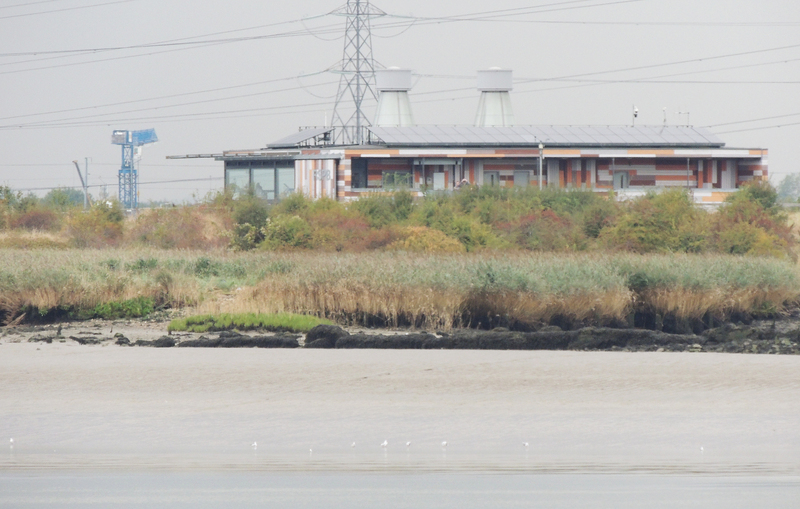 Off for a visit to the RSPB reserve at Rainham Marshes on the Thames estuary to the east of London. The weather is dull and overcast although the sun occasionally breaks through as I begin my circuit of the reserve. The feeders by the visitor have good numbers of House Sparrows, a once common bird which has declined in recent years. 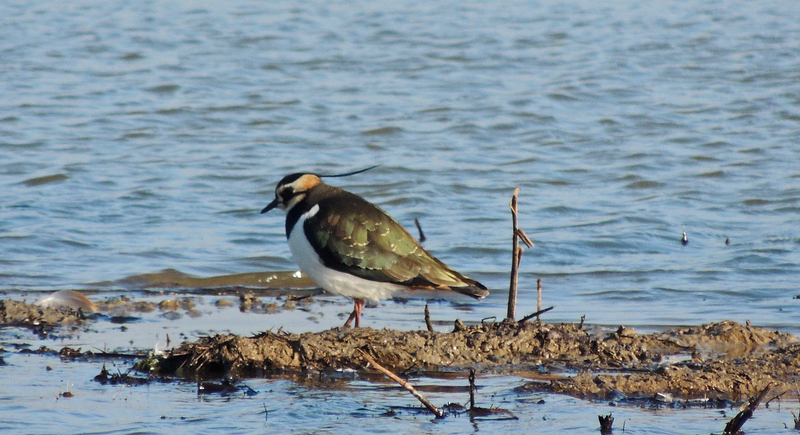 I first go to the Purfleet hide to see the large group of waders which has gathered in front of it. 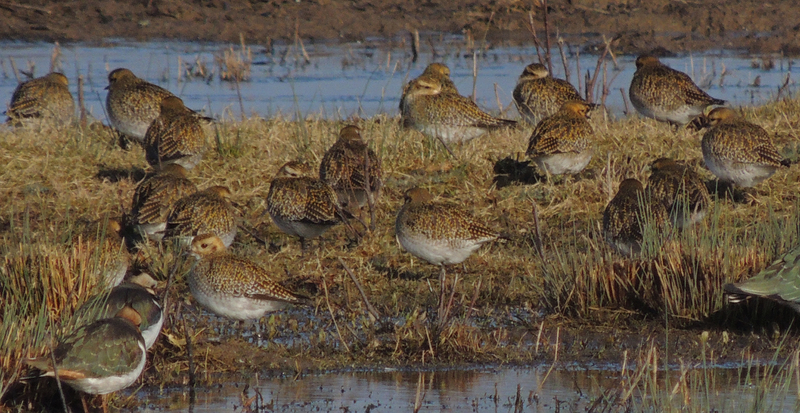 These turn out to be Golden Plover and Lapwing. 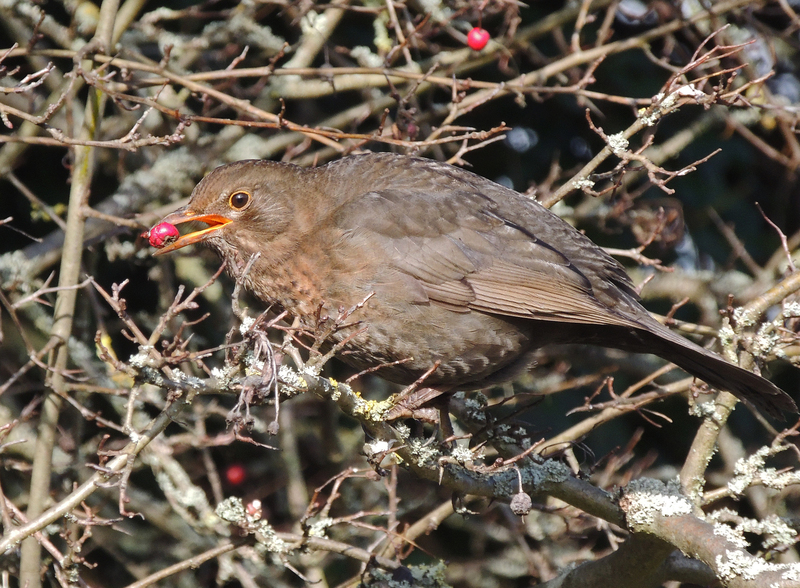 In the woodland I come across a female Blackbird busily gorging herself on berries who seem oblivious to my presence. 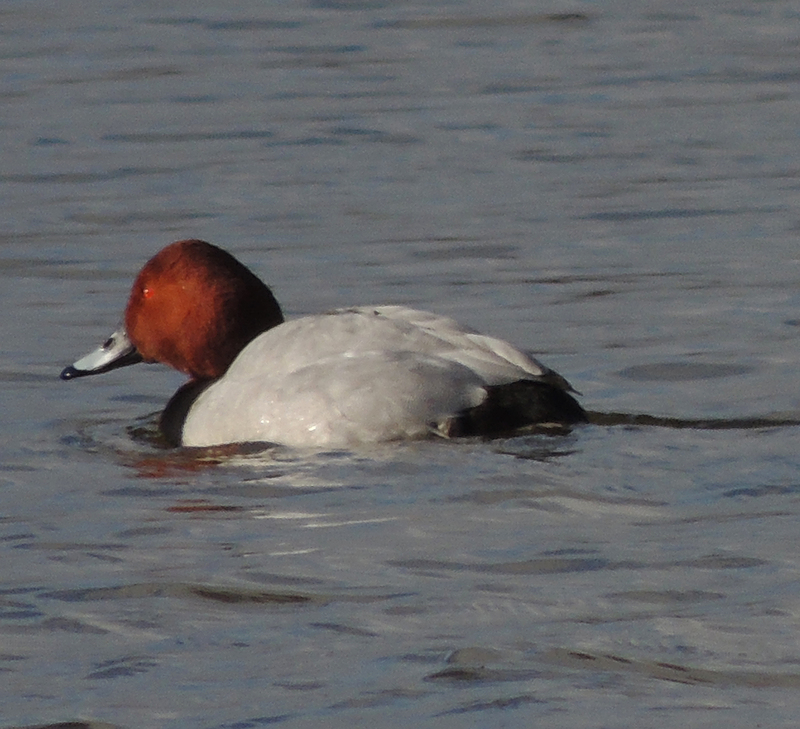 The Reedbed is unusually quiet and the anticipated Water Rail does not materialise, but I can see plenty of birds out on the marsh so I proceed on to the Butts hide which has marsh on both sides. 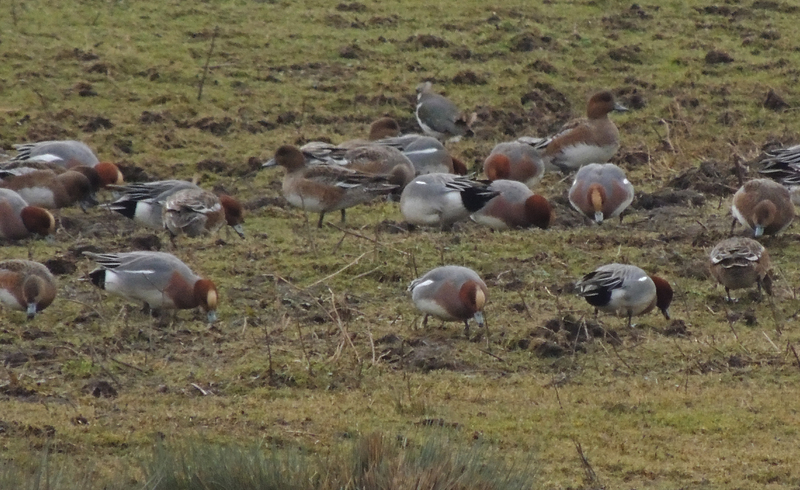 There are a huge number of Wigeon on the reserve and their whistling call can be heard from the walkway. On the Target pool to the west of the hide are a good collection of gulls whilst 2 Marsh Harriers hunt over the reedbed beyond. As I leave a croaking noise alerts me to one of Rainham’s resident Ravens as it passes over the marsh. 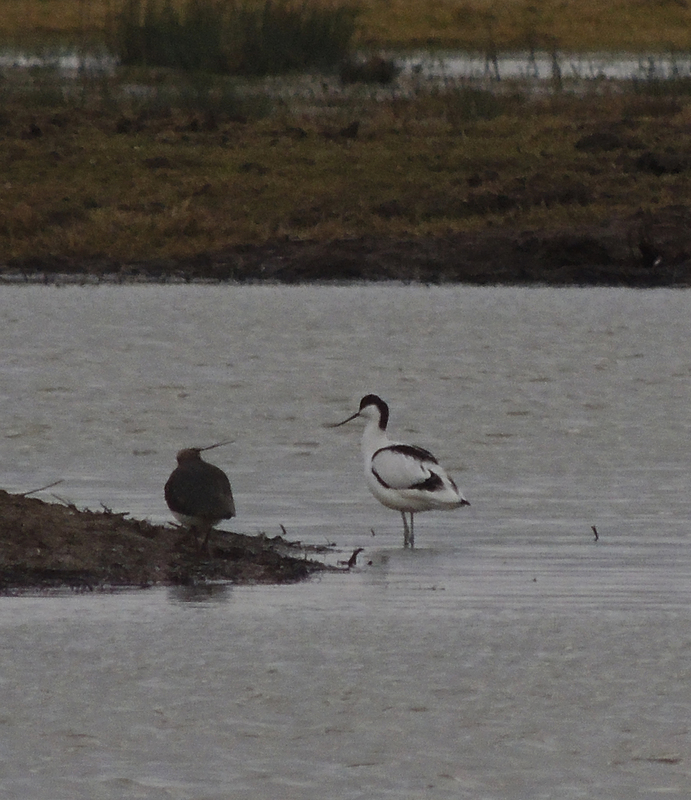 Arriving again at the Purfleet hide a single Pied Avocet is soon located out on the marsh. 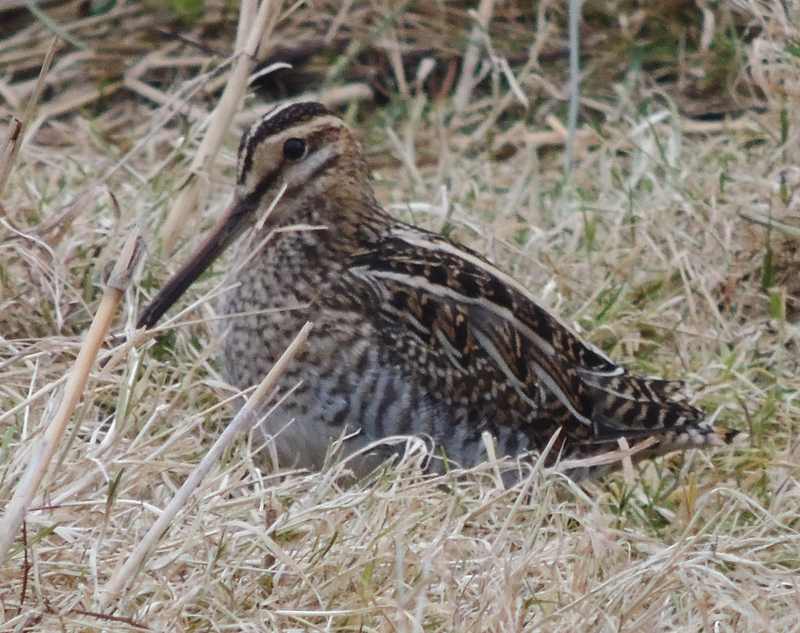 Looking alongside the hide I see a bird moving in the grass and closer inspection reveals it to be a Common Snipe which obligingly poses for photos before moving off. Then back to the Visitors centre for a hot drink before commencing my journey home contented with a good days birdwatching. 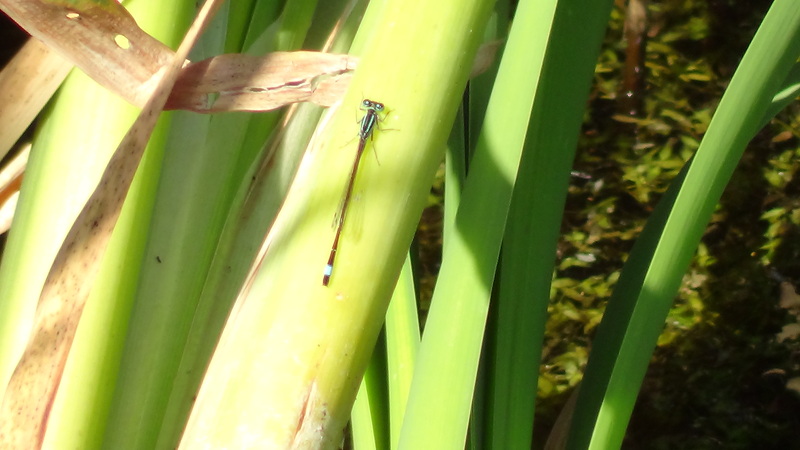 Off today to look for Dragonflies and Butterflies at Rainham Marshes. 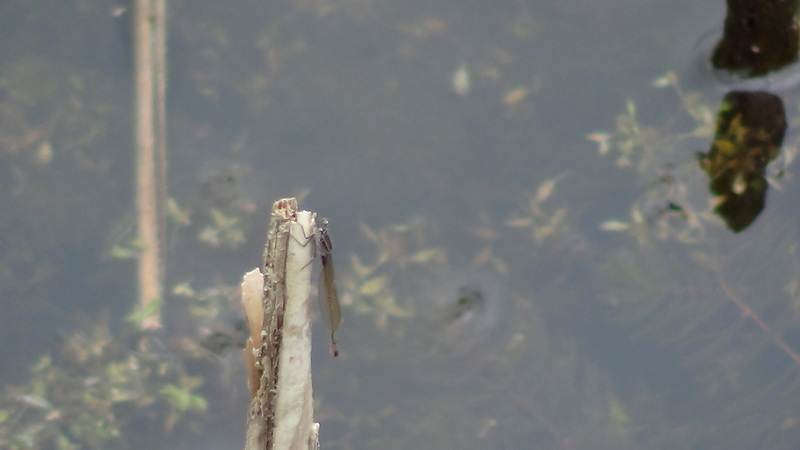 A walk around the Tarn on the way to the station rewarded me with a fleeting view of Kingfisher. The day at Rainham didn’t start well as almost as soon as I arrived it began to rain (not the best weather for seeing insects). I did seriously consider just calling it a day and going home but after I had lunch it did seem to be clearing up so I held on for a while and by 2pm it was bright sunshine. 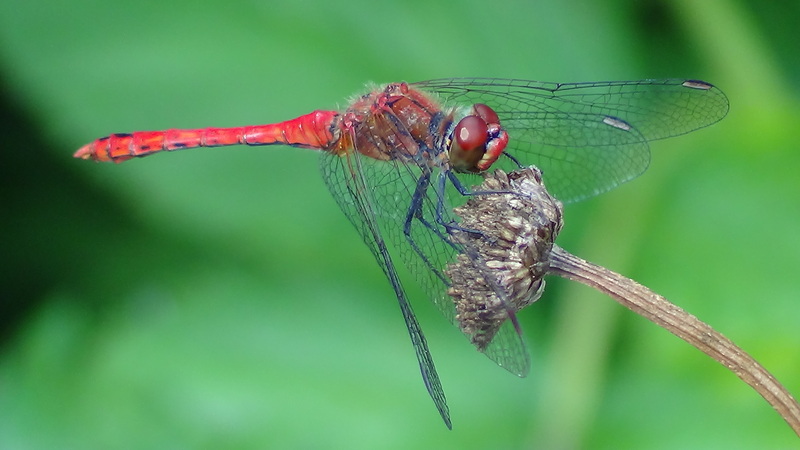 A walk around the reserve rewarded with some great sightings of a number of Ruddy Darter, a couple of Common Darter and a few Azure and Blue-tailed damselflies. 8 species of butterfly were seen during my walk, although there was no sign of the Painted Lady which had been reported earlier. 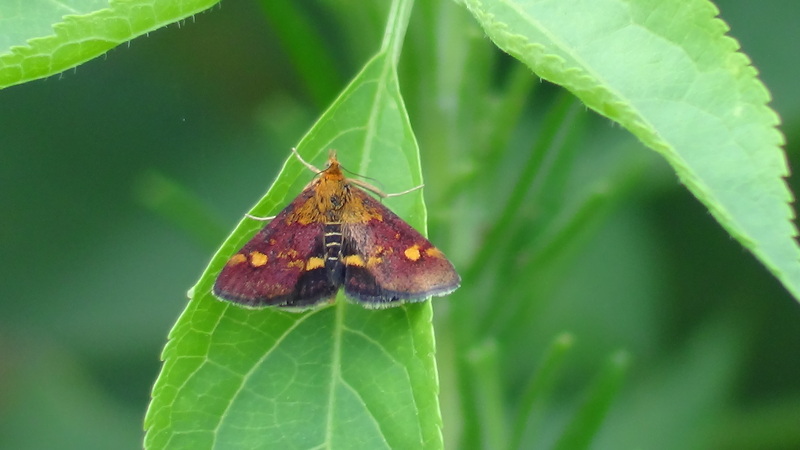 There were also a number of day flying moths including Mint Moth on the wing. 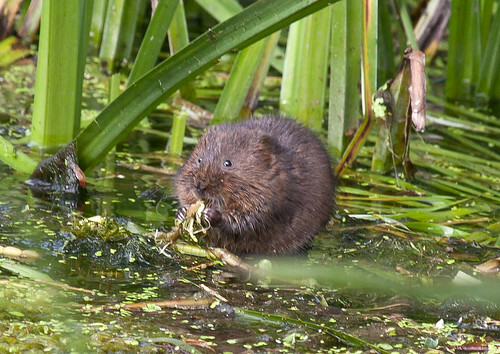 Also managed to see a water Vole sitting in the reeds. 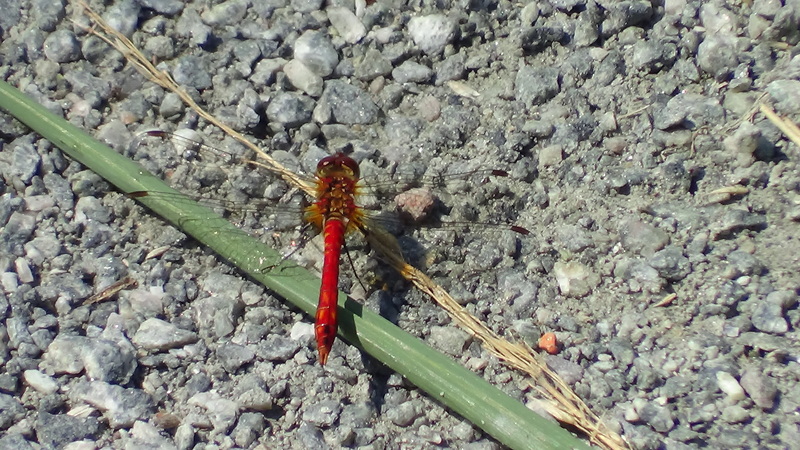 This is the first time for a number of years that I have managed to see this secretive creature in the wild. 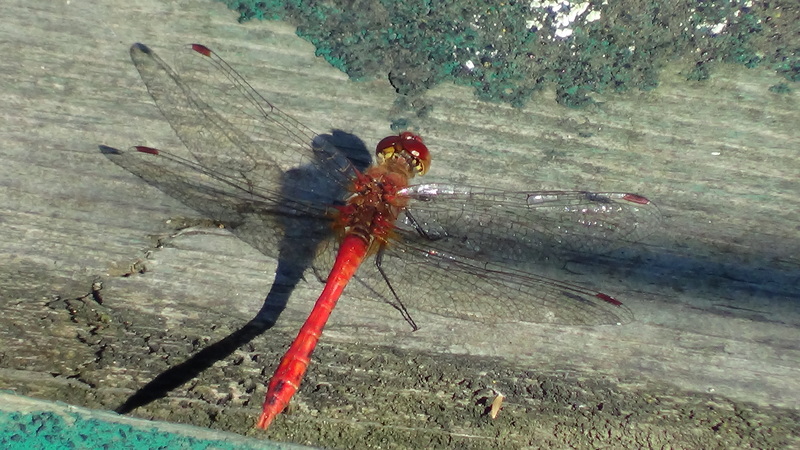 This was a great return in view of the lunchtime weather and the continuing winds which would have been difficult for dragonflies and Butterflies. At last summer seems to have arrived and off to the only RSPB reserve within the London recording area. 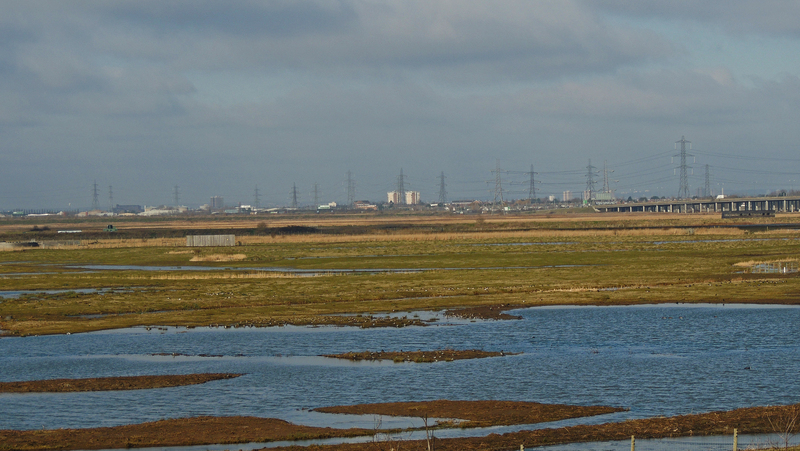 Rainham marshes is located on the eastern edge of London beside the Thames. 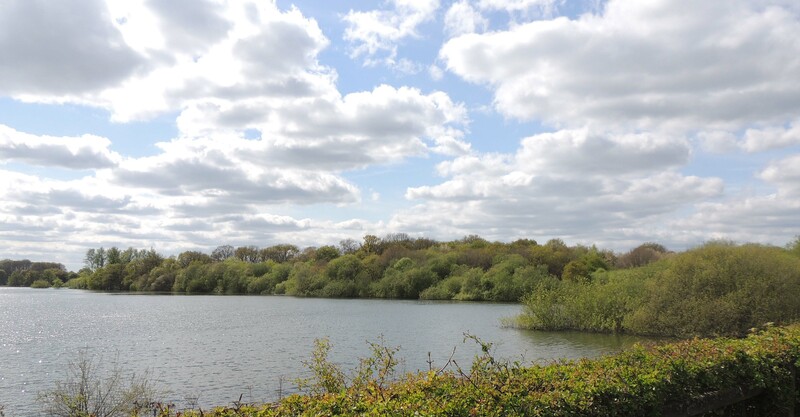 The land was previously a military shooting range but has been developed over the last 10 years into one of the best nature reserves in the country. 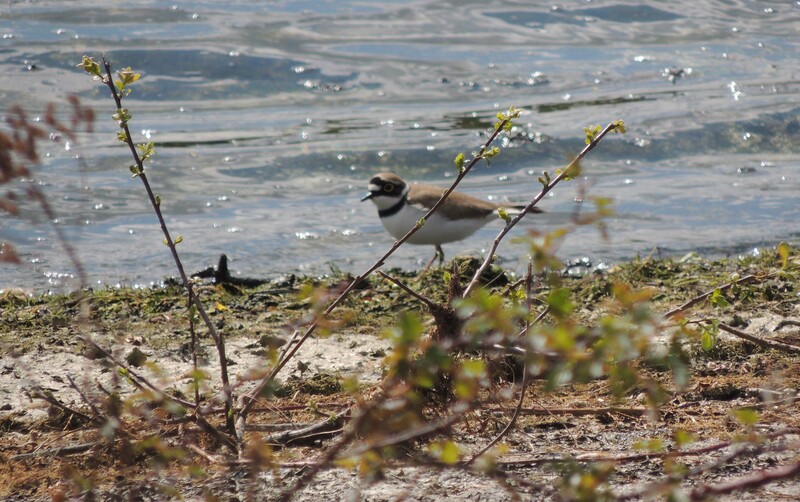 June tends to be one of the quieter months for birds as those present are occupied in raising their young and therefore there is little movement other than in a restricted local area. My targets for today were to record Hobby within the London area and to see what dragonflies and butterflies the sun has brought out. 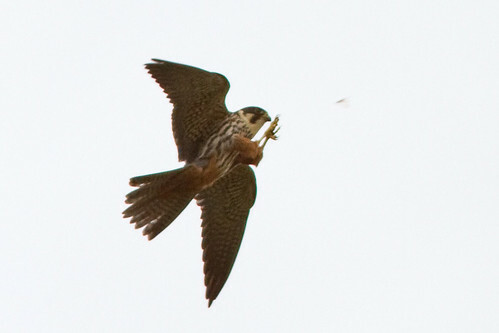 Like many of our birds of prey the Hobby was once a rare nesting bird in south-east England. However over the last 10 years. This situation has changed and they are now seen far more commonly in the area. 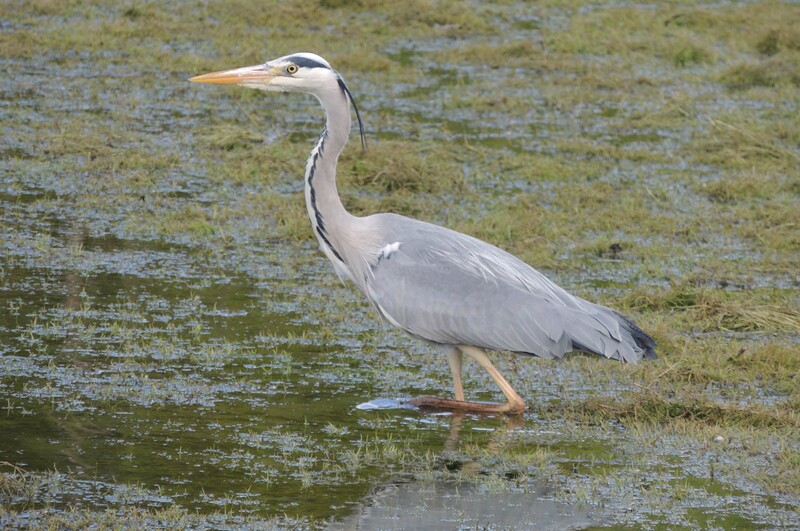 I was fortunate to have three views of the bird during my visit, including one at very low level as it passed over the hide. Unfortunately, far too quickly for me to get a photograph of it. 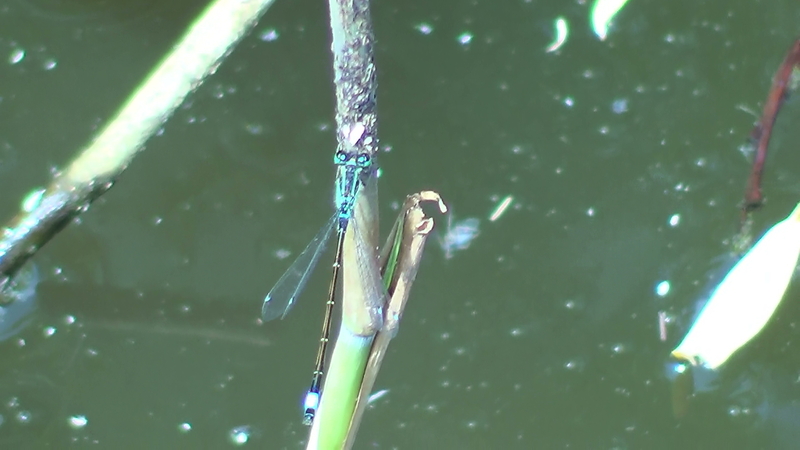 On the dragonfly front I was able to find Blue-tailed Damselfly and Azure Damselfly. 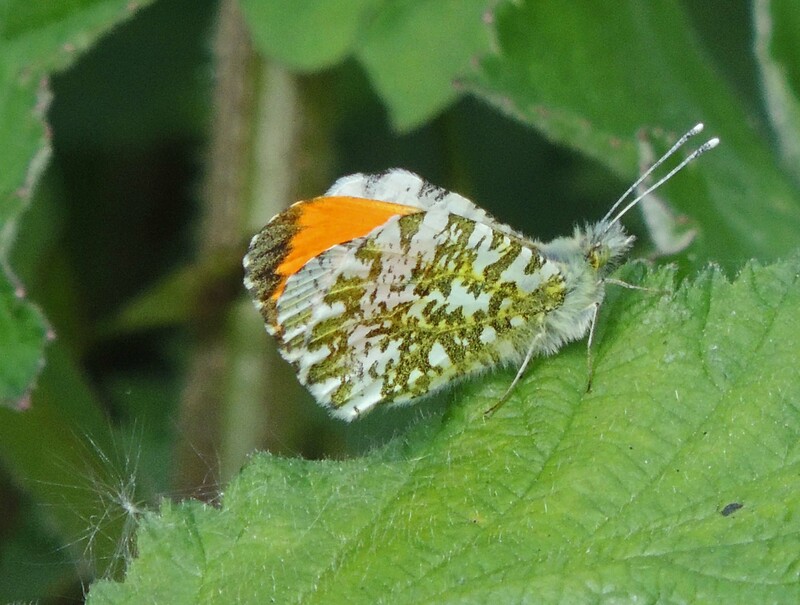 The butterflies were slightly more disappointing and the only new species seen was Small Tortoiseshell. 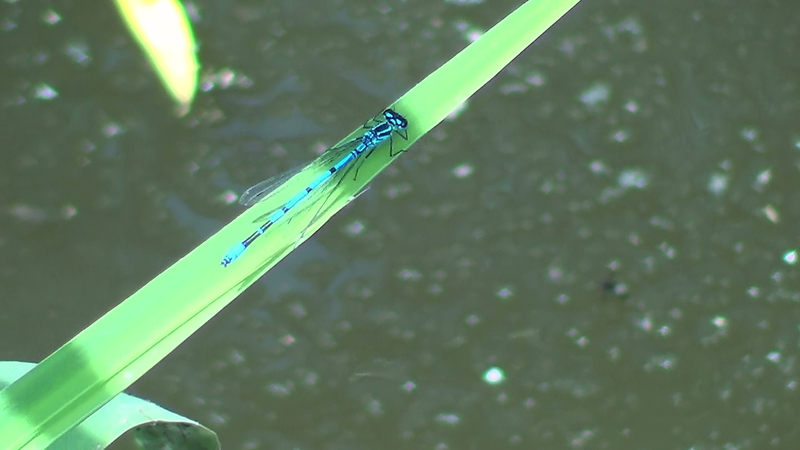 I was interested to hear that the situation of our ‘winged insects’ in the UK made national radio news this week and was in a number of the newspapers, as conservation organisations reported that the combination of last year’s poor summer together with the delayed spring this year have seriously affected butterfly and dragonfly populations.